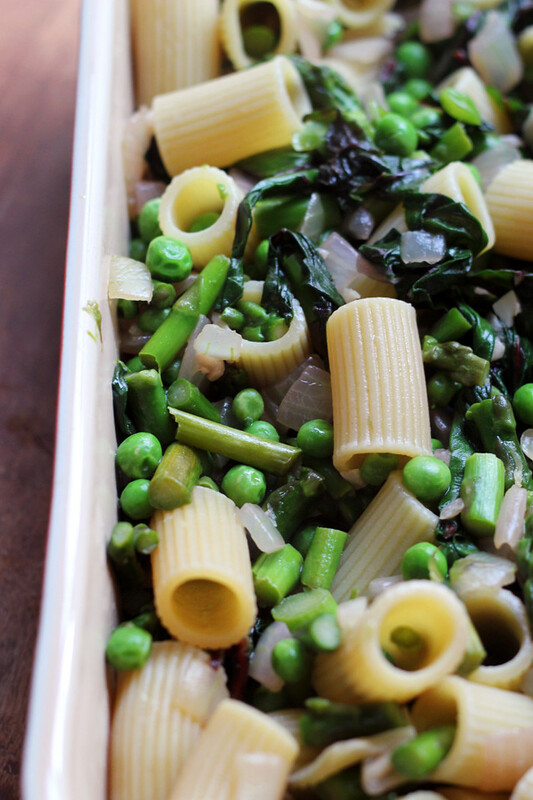 The vegetables outnumber the pasta in this cheesy spring vegetable rigatoni bake, filled with asparagus, Swiss chard, and peas. If there’s one thing my week-long stint as a third year medical student taught me, it’s that when I actually do go back in the fall, throwing together big meals that can feed us for weeks on end but take minimal time to prepare are going to be key. I feel you guys. I really do. But why should we wait six months to reap the benefits of my newfound cooking ethos?! And by that I mean, this pasta bake saved my life last week and I would be severely remiss if I didn’t tell you about it before we all move on from asparagus worship to pumpkins and tomatoes and zucchini. I know it’s going to happen. Don’t fight it. This is actually a study of what happens when you go a little veggie-happy at the grocery store and then have no energy to do anything with anything when you get home from a long day of staring at uninterpretable EKGs. You’ve been there? I thought so. It’s easier than easy and essentially involves giving all of your veggies a brief saute (in this case: asparagus, peas, and Swiss chard) in a touch of olive oil while your pasta cooks so that they’re just a hint of tender and totally warmed through. Throw them all together in a baking pan along with a fontina cheese sauce and a container of ricotta, top with mozzarella, and bake until bubbly. Bring a large pot of salted water to a boil. Add the past and cook until al dente, stirring occasionally, about 6 to 8 minutes. Drain and set aside. In a large skillet, heat the olive oil over medium heat. Add the onion and garlic to the pan along with a pinch of salt and saute until just tender, about 4-5 minutes, stirring frequently. Stir in the asparagus and saute until bright green and slightly tender, about 3-4 minutes. Add the Swiss chard leaves to the pan and cook until wilted, about 2-3 minutes. Add the peas to the pan and cook until just heated through. 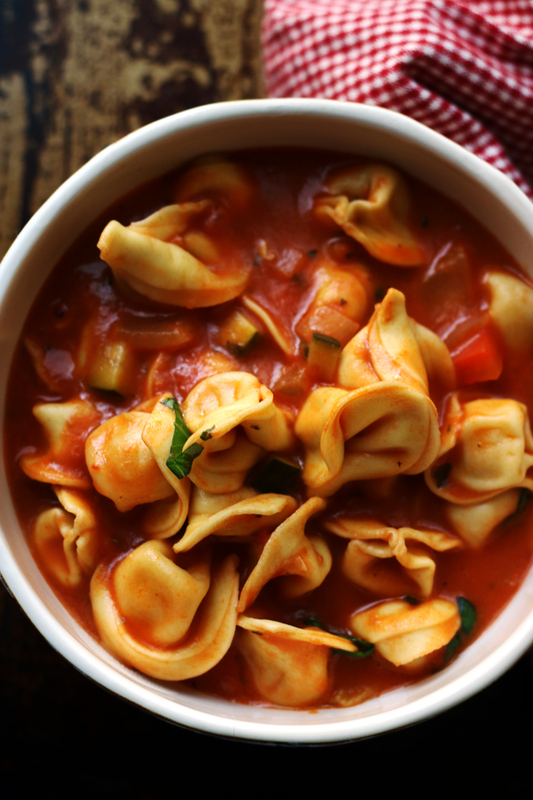 Pour into a 9x13-inch baking pan along with the cooked pasta and mix together. Return the skillet to the heat and pour in the whole milk, heavy cream, and basil. Bring to a simmer. Remove from the heat and stir in the fontina cheese and the ricotta, until melted. Season to taste with salt and black pepper. Stir the cheese mixture into the pasta and veggie mixture. Top with the grated mozzarella. Bake for 30-35 minutes or until the top is golden. Let rest for about 5 minutes before serving. 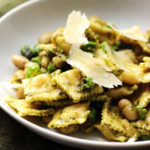 I’m definitely all about having my veggies with a side of pasta at this time of year (rather than the other way round) so this sounds totally dreamy. This dish = cooking story of my life. Sold! This is the type of meal I like to make on Sundays when I’m tired! 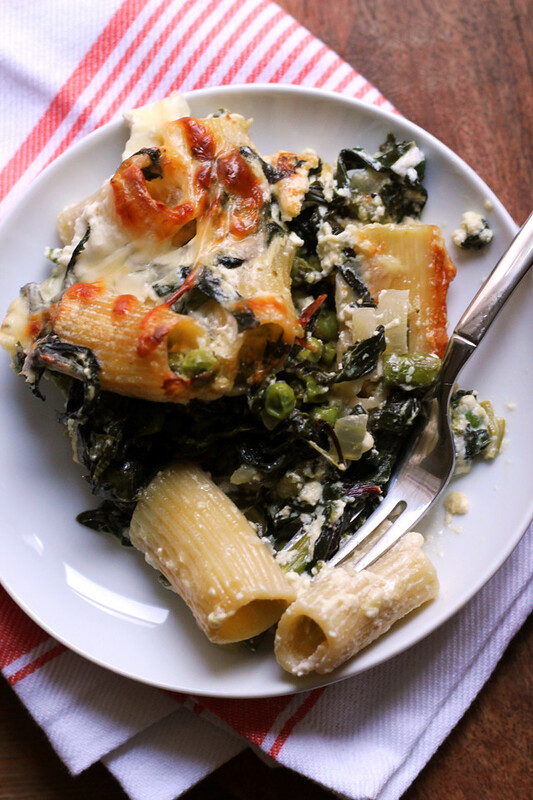 Three green veggies and three cheeses – I’m in!! haha, yes!! you know! 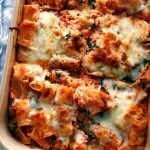 Pasta bakes to the rescue!!! LOVE this one!! Venipuncture? I’m afraid to ask. 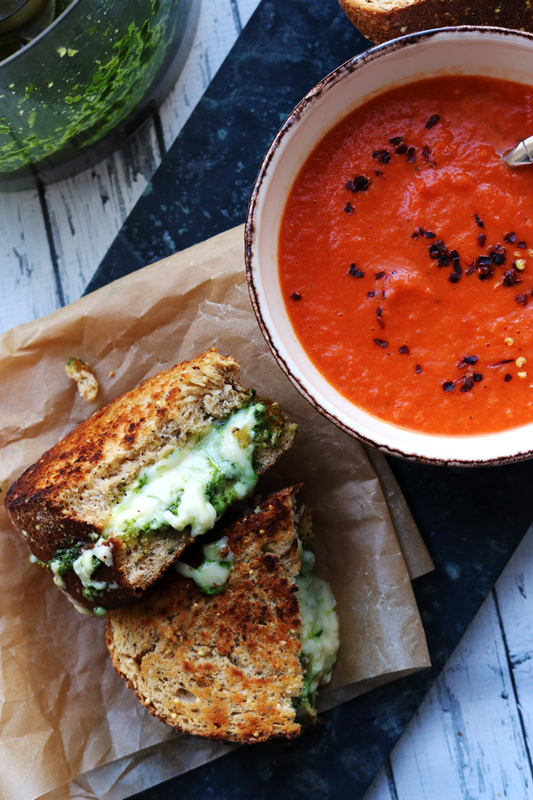 But whatever it is, this cheesy springtime gloriousness is definitely the cure…YUM. YES to cheesy pasta bakes. The world’s most comforting dish! 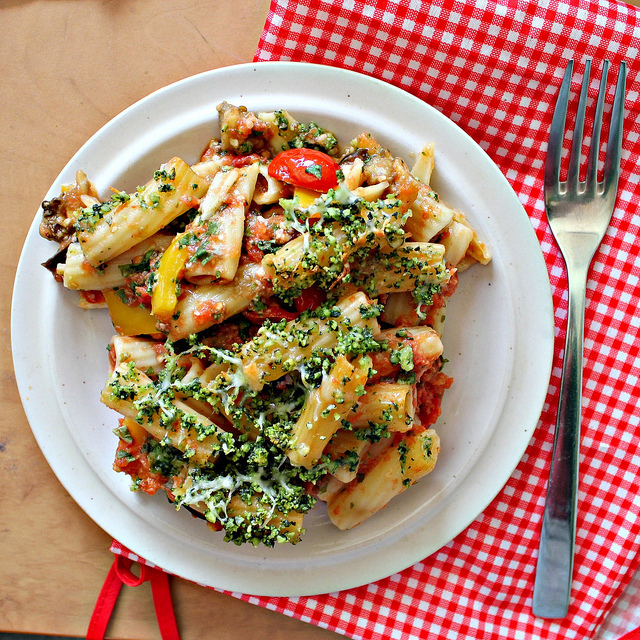 These days I don’t eat much pasta any more, but I would love this veggie heavy rigatoni on my dinner table! It looks splendid! Quick meals? Yes pleaasse. Every season change, I take it as an excuse to be lazy and ‘enjoy the season’ while it lasts, so that really translates to being too lazy to cook — which is a problem when Michigan has major weather changes every couple of days. This looks like a life saver! 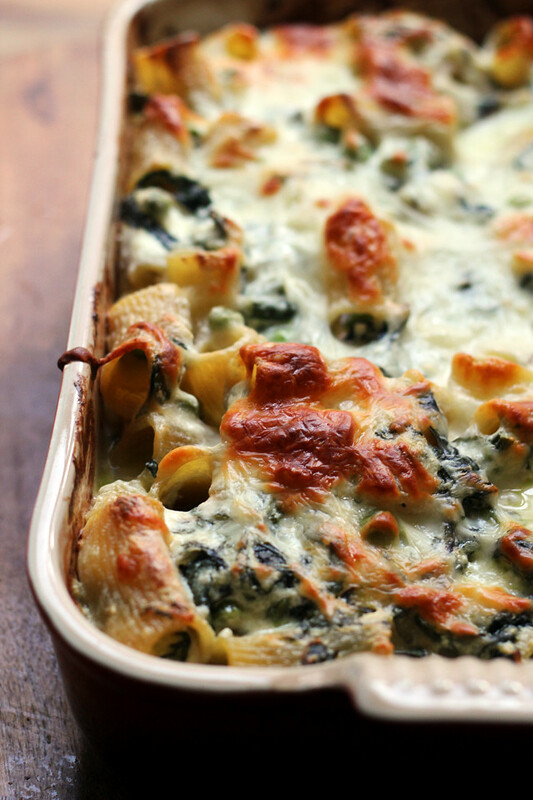 I love those delicious green veggies you loaded this pasta bake with and then seeing it all browned and cheesy…so craving it!! I may not be in grad school anymore but I can still appreciate not destroying my kitchen every night that I cook. As for all the veggies, bring it on I love it! I actually just made super vegetable loaded breakfast enchiladas over the weekend but they are being saved for #brunchweek in early may. Swoon! Love this pasta bake, Joanne. Cheese and veggies for the win any day. All I can say right now….is YUMMM! 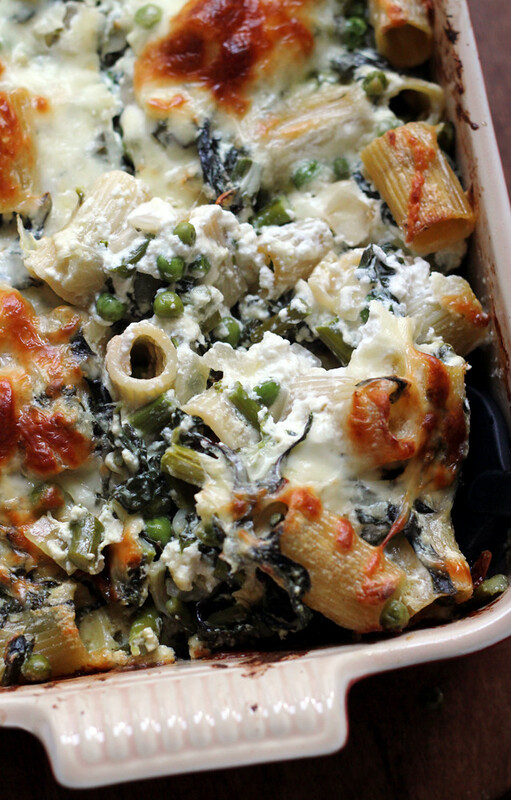 Thank you for the Spring Veggie Rigatoni Bake! Thank you for the recipe I meant to say. Mmm, this sounds perfect on this gloomy day. 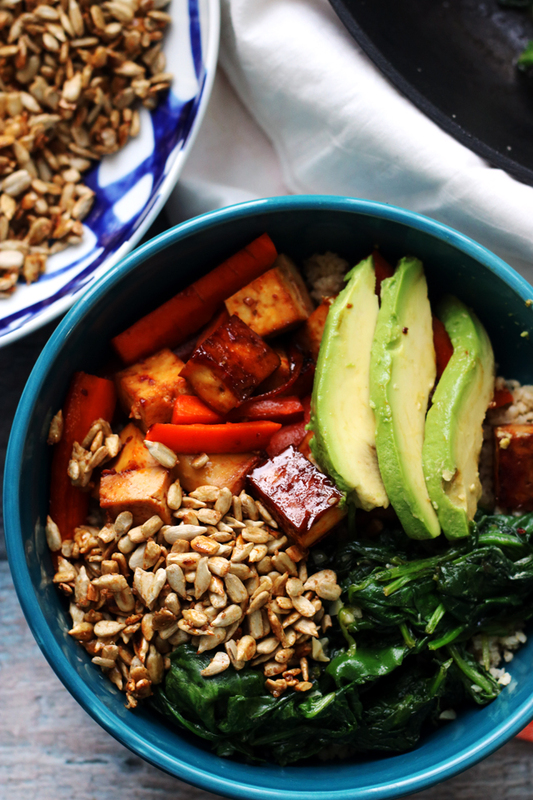 I love big dishes like this that leave plenty of leftovers! ALL of the CHEESE and ALL of the VEGGIES and PASTA! YES! Plus it is easy, HELL yes! 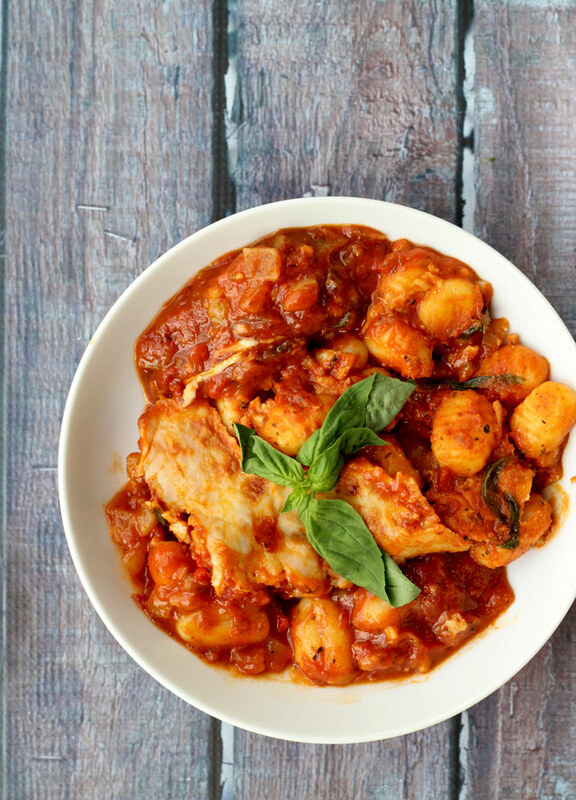 I think it looks healthy, comforting, and delicious – perfect for those crazy days with little time to make a meal. Nicely done Joanne. Amen- this is what we want too! Perfect to feed the whole family! All the vegetables! Giant pasta bakes like this are one of my favorite dinners, hands down. NOM. 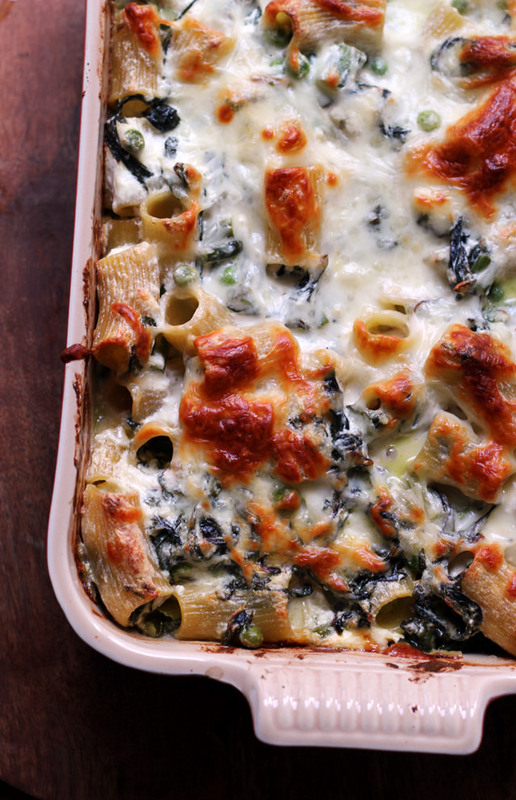 I so love hearty, vegetable, pasta and cheese bakes like this. YUM! 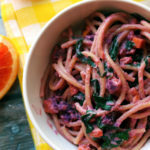 Love spring pasta dishes! Looks super goo with all those veggies! Wait, it’s only been 3 years? Doesn’t it feel like forever? Lol. 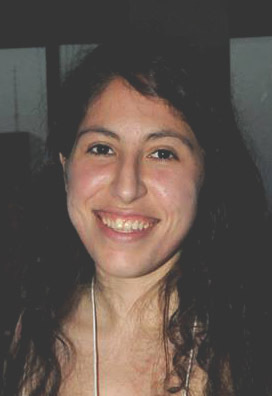 Shouldn’t you already be a doctor by now! *shakes fists* I love this…I mean, two of my favorite vegetables. And cream. Seriously. Love all the veggies in this. Very comforting looking indeed with all that cheese. Love it! All the veggies in this bake sounds yum. 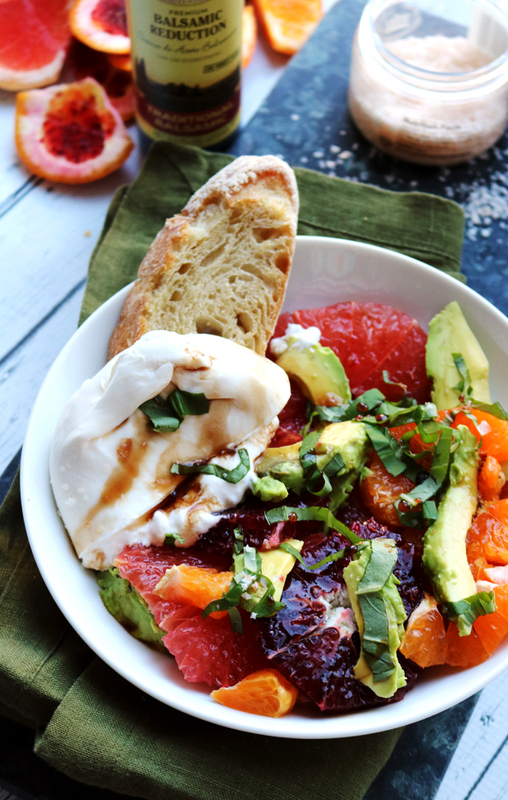 Love meals like this which come together in a jiffy and tastes oh so good. Busy weeks definitely need meals like this. I love how vegetables are the star! Wah! I absolutely, positively need this in my life. As a newish cook who still approaches adjustments to The Recipes with trepidation, how would I go about adding or substituting my husband’s favorite broccoli in this recipe? Put it in along with the onions? Because wouldn’t it need more cooking time? This looks delish. I would still saute the onions first, and then add the broccoli after that, but before the asparagus. I would cook it for 3-4 minutes before adding in the asparagus. I love that this is heavy on the vegetables. I will be making this! 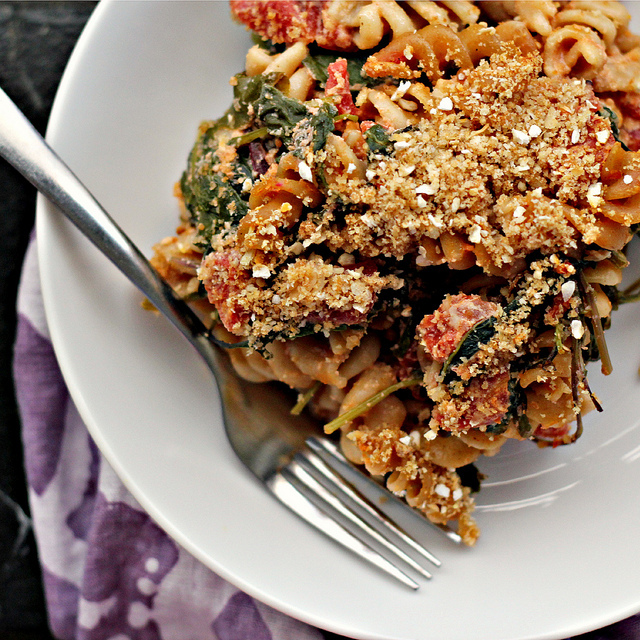 Love everything about this pasta bake especially how easy it is and how much it makes. Plus it screams Spring! Yum. This is such a gorgeous dish, my dear! Mmm… so delicious! I need this in my life! 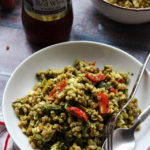 Quick and easy meals that are chock-full of veggies? 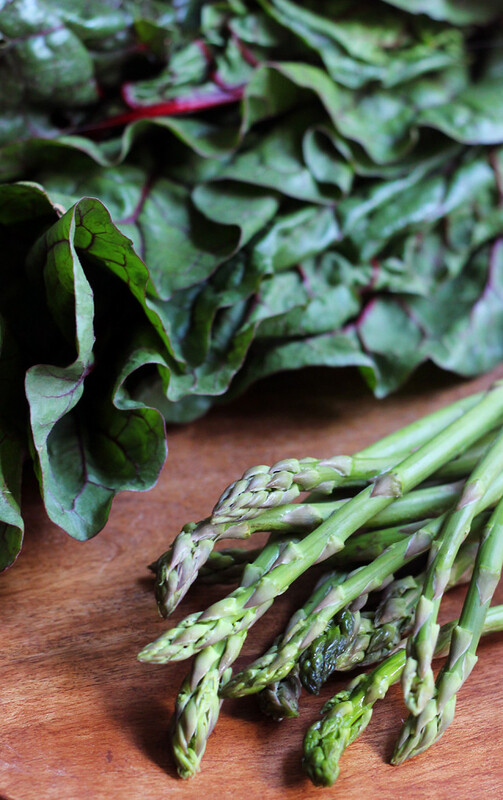 I’ll take them all please 🙂 Love the swiss chard and asparagus in here, looks comforting and delicious! Yes, I would eat thirds on this one too. Looks delicious! I start medicine internship in two months and I will definitely have to change the way I cook, more speedy and low effort meals like this. That is, if I manage to cook at all! I have such nostalgic pasta bake memories… my mom is a super busy working woman and so she used to make me and my dad baked ziti ALLLLL the time and let me help! And by let me help, I mixed up that ricotta filling from the recipe on the back of the box and she chopped four bags of spinach to stick in so that I got my vitamins. Isn’t that the best? 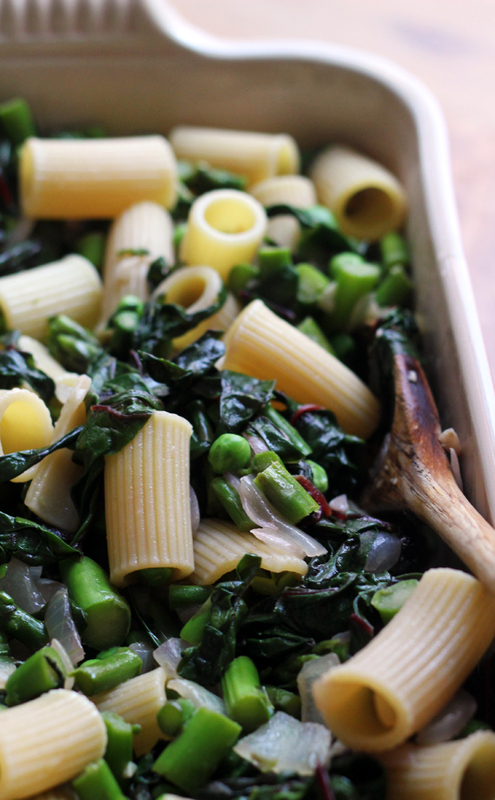 Rigatoni is one of my fave pasta (it’s like fat penne, how cute is that, seriously) and I love all the spring veggies in this! Peas and pasta are such an underrated combo.